Home > What is the SUCCEED® Challenge? 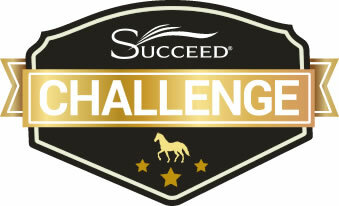 What is the SUCCEED® Challenge? 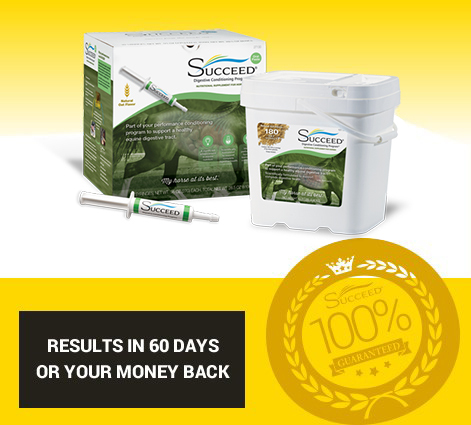 When you purchase a 60-day supply of SUCCEED through the Challenge, you get to try it risk-free. See positive results in 60 days, or you get your money back. It’s that simple. Oh, and it also comes with free shipping, a free 10-pack oral paste starter kit, and a printed diary with tips to help you measure your horse’s success. Note: the SUCCEED Challenge is for original SUCCEED. It is available to U.S. residents only, 18 years or older, who have not used SUCCEED within the last 6 months and who have a ship-to address in the 48 contiguous United States. Why Should I Take the SUCCEED® Challenge? Many performance horses today face a number of challenges that can affect their natural digestive balance and, in turn, their performance, training and overall health. SUCCEED steps in where management leaves off, to promote total digestive wellness in your horse. The SUCCEED Challenge allows you to see the benefits of SUCCEED for yourself, risk-free. What Does the SUCCEED® Challenge Cost? I’m Interested. What’s the Catch? There isn’t one. We’re confident that you will see positive attitude, performance, or health changes in your horse by the end of 60 days on SUCCEED. But if you aren’t convinced, we’ll refund your entire purchase price – no questions asked.